“Harbor for Industry” by Lindsay McCosh. A new crop of sculptures was unveiled along the Hudson in Riverside Park South last week. Artist Lindsay McCosh used the park’s industrial artifacts, including a defunct train and lifting station, as the inspiration and backdrop for her piece “Harbor for Industry,” an architectural vision of nature in which the four elements are represented by a pair of cement figures, a beacon, a wind turbine, and the Hudson River. 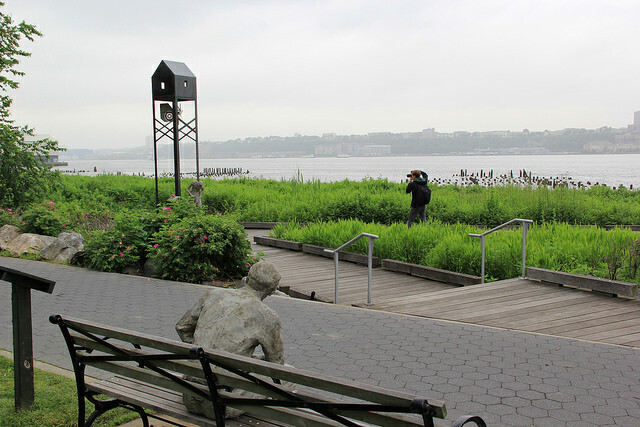 Located between West 59th and West 72nd Streets, along the Hudson River shore, Riverside Park South was turned into a public exhibition space for works by artists from the Art Students League four years ago as part of the Model to Monument Program (M2M) which trains artists to create works for public spaces. This year’s theme, “The Architecture of Nature, ” was rendered by seven female artists: Phyllis Sanfiorenzo, Natsuki Takauji, Laura Barmack, Minako Yoshino, Ana-Sofia Marti, Janet Fekete-Bolton and Lindsay McCosh. Phyllis Sanfiorenz, Natsuki Takahuchi, Minaco Yoshio, Laura Barmack, Janet Ficket-Bolten, Ana-Sofia Marti and Lindsay McCosh. Each artist underwent nine months of intensive training to learn to create monumental works that meet the standards of engineering and public safety required by the Parks Department. The resulting sculptures took the form of McCosh’s homage to urban workers, a functional swing, a tabloid-reading merman, an abstract tangle of metal cords, a nine-foot statue based on two lovers from Japanese mythology, and 150 paint can lids suspended in a flying sombrero-like arrangement. The sculptures will be in place until May 2015. Lindsay McCosh studied Graphic Design and Typography at the School of Visual Arts in New York; multimedia sculpture and reliefs in handmade paper at the Center for Creative Studies in Detroit; and at the Art Institude of Chicago.